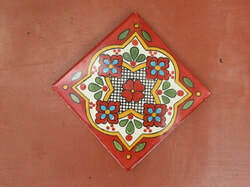 More than just 12" Mexican Saltillo tile! 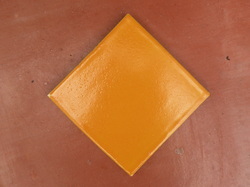 Most people who haven't visited us think we are just the largest seller of 12" Mexican Saltillo tile in West Palm Beach. We have a huge selection of Talaverra tile in both 4" and 6" sizes! There really are too many to picture here but if you look at slide number three above, you'll see just a fraction of what we carry! Visit us today or call us with questions! 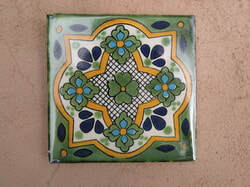 Huge selection of decorative Talavera tile! This awesome decorative tile is the perfect accent piece for a saltillo floor! Comes in both 4" and 6" inch! 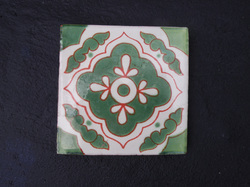 Another awesome accent tile with cobalt blue back, red and a splash of verde! Need a splash of color? Or how about a solid color? Green accent piece provides nice contrast with a 12" saltillo tile!